We do research to spread knowledge and provide relevant data in the field of Talent Communication. We believe that the way employers speak to, and interact digitally with their candidates has a big impact on their employer brand, on their talent pipeline, and eventually on their success. In the world of consumer products, all kinds of studies on behaviour and preferences are done to sell more. But what about the “other side”? People are the most important asset of today’s companies. With our studies, we want to find out what candidates expect to hear and read from employers and what they expect from the application process itself. These insights help employers to improve their digital Talent Communication, attract the right talent, and convince them to work for them. With the Potentialpark Study we collect every year statistical relevant data globally and turn them into insights for employers. Read more. We ask a panel of candidates to test career channels and give direct feedback about a specific employer. Read more. The Potentialpark study is the most comprehensive study about Talent Communication on the market. Every year we ask thousands of students and graduates about their needs and preferences, and evaluate the career channels of hundreds of employers worldwide. Every year we create a list of criteria describing all market-relevant features when communicating with talent. Since 2002 we’ve adapted this criteria list according to new preferences, new technologies, and changing habits. Based on the criteria, we develop a survey and reach out to candidates worldwide with a special focus on undergraduates and graduates. We collect the input from more than 25 000 respondents every year and cover all fields of study possible, with special focus on IT, Engineering, and Business Schools. 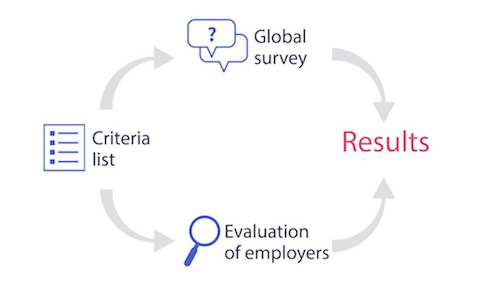 We evaluate hundreds of employers’ career channels using the same criteria list as in the survey to assess the market performance. The employers we select to be in our rankings are either top performers from previous years or representative employers in our key markets. This allows us to keep our rankings relevant and with high quality. Our field period is from September to December, and we release the results during our Potentialpark Conferences between February and March every year. We bring together the outcome of both the survey and the audits: we know what’s most important to candidates and if employers implement it or not. The rankings reflect the competitive landscape of employers within Talent Communication in each market. Who is most talent friendly? Offered to employers who want to know their own status compared to their competitors and who want to develop a more talent-friendly communication. As a complement to our global study, we conduct perception panels with smaller groups of candidates who take an in-depth look at specific career channels and selected parts of the application process. We analyze their a priori expectations and associations regarding your employer brand, and illustrate the influence of your online communication on their perception. You can order your Perception Panel anytime. We conduct these studies between March and May every year. The individual results are brought together in our Talent Experience Report, where we provide open and direct candidate feedback together with expert analysis about the user experience regarding navigation, look & feel, and relevance of your content and messages. Potentialpark commits to the quality of its studies by following the ESOMAR code on market and social research.